When David returned to London in October 1962 he had an exciting new venture in mind. He was -convinced that a version of his German television series, Grenze des Wissens, would be equally successful in England. Full of enthusiasm for the project he contacted Associated Rediffusion and made an appointment with the Controller of Light Entertainment, Elkan Allen. The meeting did not go as planned and far from being excited by David's passion for the format, Allen seemed distracted and his mind elsewhere. David, seeing this, said "I can see you're busy at the moment, let me come back another time." Allen snapped out of his reverie and apologised. "I've had an idea in the back of my mind for some years," he said, "And have just realised that you'd be the ideal person to do it." Now it was David's turn to listen. "It's a sensational show," promised Allen, "You go on television and perform some of the traditional magic tricks like sawing a lady in half or the linking rings or that trick with a cone where you pour the milk in and it disappears." "Yes," said David, wondering where this was leading. "And then you explain how it's done." David could hardly believe what he was hearing. "Pardon," he said. "You show the viewers how it's done," repeated Allen. David was furious. He remembers having a very strange reaction, physically trembling, both angry and surprised that anybody could even suggest that he would do such a thing. At the time it was without precedent. Television had shown no interest in exposing the magician's secrets. It came like a bolt from the blue and struck with devastating effect. He had come to pitch his dream show and now was being asked to host a show in which magic would be degraded and reduced to its lowest common denominator, its secrets. He told Allen that he couldn't possibly take part in such a show. It went against the traditions he believed in and would hurt his fellow professionals. "What's the matter, are you afraid of The Magic Circle?" asked Allen. "Absolutely not," replied David. He might have tried to make some cogent argument that Allen would understand but the truth was that he was too shocked and hurt to respond properly. "I can promise you more money than you've ever earned. Sensational publicity too. It will make you in a big way," said Allen. But it was too late. David was crushed. He left the office, his previous enthusiasm a dim memory. But on the way home, still shaking with anger, he began to ponder the situation. He had been performing his own original routines on television for years. What if he could create a television series, filled with his own original ideas, challenging puzzles that he could reveal at the end of the show. Surely magicians couldn't complain about that? Today David freely acknowledges that he might have been wrong. Even in the most original of routines the thinking that underpins them is often the foundation of other illusions. Other magicians could have complained, and often do, that any exposure is damaging. David didn't think of that at the time. Instead he had risen to the challenge and devised a show that would fulfil Allen's requirements and yet be magically innovative. He thought about it for some days afterwards before calling Allen again and making another appointment. "I knew you'd be back," said Allen. David asked him to halt the celebrations for a moment and just listen to what he was proposing. He said that he would be willing to do a show in which he performed sensational magic effects and then reveal how they were done in detail. But there was more to it than that. A panel would be challenged to discover the secrets of the illusions he performed. Celebrities and experts would put forward their views as to how they thought the tricks were achieved. Could they solve the mystery together? This challenge would segue nicely into the commercial break. After the break David would re-enact the illusion but this time reveal the mechanics behind it. And here more entertainment was promised. The panel would be wrong. David's solution was far more ingenious with lots of fun and twists and devious strategies that everyone was sure to admire. Allen thought it sounded marvellous. David had formatted the rough idea he had, adding entertaining detail that made it sound like a winner. "However," said David, "There is one condition. At the end of each show you have to guarantee me three minutes television time." Allen asked why. "Because in those three minutes I will repeat the illusion and baffle the panel and audience once again, proving that there are other ways to achieve the same effect." It was a sensational idea and Allen gave the go ahead immediately. The show could take over the 7.30 pm slot on Thursdays when the popular television quiz Double Your Money was taking its annual rest. During the coming weeks David created 12 original routines to feature in the twelve-week run that Allen proposed. Each illusion would be revealed to the audience and then performed in a completely different way to leave them even more baffled. On paper everything looked fine but first there would have to be a pilot show. The pilot took place at Associated Rediffusion's studios in Kingsway. In those days pilots weren't taped but it was played throughout the building on close-circuit television so that the various executives could watch it. An audience was invited. Five panellists took part and a new illusion made its debut. It had never been tried before, anywhere, and David was more than a little apprehensive. This is what they saw. David introduced a panel of celebrities and began the show with a few remarks about the current fad for self-assembly furniture. Chairs, tables, cabinets and wardrobes came in kit form and could be put together by the keen DIY expert at a considerable saving. Two dozen such kits could be seen arranged on some racks at one side of the studio. A lady was invited from the audience and asked to look through a catalogue illustrating the various pieces of furniture. They included a bedside cabinet, a desk, a large toy locomotive, a dressing table, a hi-fi unit and more. As she looked through the catalogue David asked her to think of just one of the numbered kits. A camera peered over her shoulder so that the audience could see the many different pictures she had to choose from. David suggested that the viewers might like to think of an item as well. She chose kit number 9, a kidney-shaped dressing table. Two assistants collected it from the rack. The kit consisted mainly of flat pieces of wood bundled together and David pointed out that there was also a three-fold mirror and a cloth drape that surrounded the table like a skirt. It would take a handyman some time to put it all together. Or, as the audience would shortly see, you could put the kit into David's magical DIY cabinet and the whole operation would take almost no time at all. for a number of woodworking tools, a hammer, saw, chisel etc, hanging from the ceiling of the cabinet on lengths of string. David asked some more members of the audience to assist. Some went into the cabinet. It had no base but they stamped on the concrete floor of the studio anyway, looking for trapdoors. Another volunteer went around the back, shining a torch through the gaps between the rear slats. When everyone was satisfied that the box was no more than a rough wooden crate, they were asked to stand around it effectively surrounding it. The dressing table kit was placed inside the box and the door closed. On the front it said "The DB DIY Machine" and on the side of the crate was a large lever. David pulled the lever to start the operation and as soon as he did the sounds of someone hammering, sawing and banging came from inside the box together with assorted grunts and groans. The hand on a large clock standing nearby started to move and marked out the seconds with a loud ticking. Within fifteen seconds it was all over. The clock hand had stopped and the box was silent. David walked to the door of the box and opened it. The tools were no longer hanging from the ceiling but were scattered about the floor. 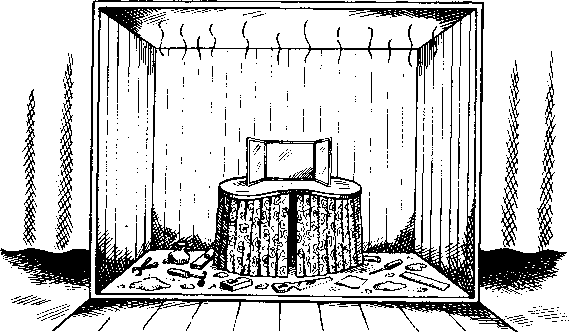 They lay among piles of sawdust, and standing amidst the sawdust was the kidney-shaped dressing table complete with triple-mirror, now fully assembled. Everyone was absolutely amazed. How was it done? popping up in some mechanically clever way, perhaps triggered by a timer. Ingenious, thought David, and said as much. But how was it really done? He promised to reveal all in the second half of the show. In part two David made good his pledge. He thanked the audience for examining the box but said that they made a very bad job of it. Why? "Well you examined the box but you didn't measure it," he said. He gave a volunteer a tape measure and asked them to measure the inside and outside. They did and found an eighteen-inch difference. "Now where did that eighteen inches go?" The front of the box slowly opened and a smiling pixie like man with red hair and a wispy beard popped his head out. "Meet Bill," said David. Bill gave the audience a wink and a wave and then popped back inside. "Bill is my secret assistant. But why did you not see him?" David opened the box again. It was empty! Bill had disappeared. David walked into the box and to everyone's surprise opened up a secret panel at the rear to reveal a hidden compartment. In there was Bill, sitting on a stool and reading a book to while away the time. He also had a sandwich and a thermos flask full of tea. "Poor Bill, he has been in there for hours," said David. The audience laughed. Bill was in fact Bill Beasley who had assisted David backstage at many shows and tours. Why didn't they spot Bill when one of the volunteers went around the back and shone a torch through the slats? Bill demonstrated by taking a similar torch off a shelf. As the volunteer at the back of the box waved his torch around so did Bill though not necessarily in the same direction. The illusion of the light shining through the back of the box was very convincing. "Let me show you what happened but this time with the doors open," said David. The assembled dressing table was hidden once again in the rear of the crate. It was David's task to make sure that the lady chose the dressing table. His ability to do this wasn't questioned. The fact that he admitted he'd done it seemed explanation enough. The kit was removed from the secret compartment and placed back in its original position on the floor and the tools were hung from the ceiling. Bill sat on his stool. The clock was reset. It was time for an action replay, this time with the front of the cabinet open. "Bill, you've forgot the sawdust." Bill jumped up, reached into a bag beside him and ran madly around inside the crate, scattering sawdust everywhere. Dashing back to his stool he quickly mimed shutting the secret door, took a deep breath and wiped his brow. Bill hammed it up beautifully and the sequence got big laughs. What is more, the explanation was clever and totally unexpected. No one had been remotely close to guessing the solution. But the show was not over yet. David had three more minutes in which to baffle his audience. "Bill, you've done a terrific job. Why not sit down and enjoy the rest of the show," said David. Bill joined the audience on the front row and David asked another volunteer to take the brochure and choose another piece of furniture. He chose Kit number 23, a child's rocking horse. It was contained in an open topped box so that the audience could see the various separate parts, legs, head, body, tail and saddle. More volunteers examined the interior of the DIY cabinet and the secret compartment to make sure it was empty. Then they stood in a circle around the crate so that they could keep it under observation from all angles. The kit was placed inside and the cabinet closed. David pulled the lever once again and to everyone's amazement they heard the same sounds of hammering and sawing coming from inside. They glanced at Bill who was still sitting in the front row. and walked towards him. He produced a lump of sugar from his pocket and the horse munched on it. Unbelievably, it was a real horse. Revelations: David had gone to considerable trouble and expense to make this pilot work. The illusion had to be carefully crafted so that not only would the effect be fascinating but so too would the revelations. Then having exposed the method he was left with the task of baffling the audience all over again. The catalogue was a large album of photographs of the various assembled kits, each photograph occupying a separate page. And the choice was not made on camera as supposed but prior to the show when David showed the album to the guest and asked her to mentally choose one of the kits. The photo of the dressing table was placed half a dozen pages from the front. It was the most interesting item in the first half of the album, with its cloth curtains and three-fold mirror. As David leafed through the pages, he timed it so that the dressing table would be the one that caught her eye, pausing briefly as he talked and noting her reaction as she made her choice. "Have you got one in mind?" he asked. "Yes," she said and David told her, "Whatever you've thought of now, and remember you had a free choice of all of these, will you think of that in the show?" Forcing a page in this way is very similar to some of David's psychological strategies with books and playing cards or his handling of the Classic Force. Timing and confidence are everything. he repeated the force and after the show many people, who watched an over-the-shoulder shot of the lady looking at the book, told him that they too had chosen the dressing table. Had David thought that the force might have failed, what would he have done? "Something else," is the only answer he can give, spur of the moment improvisations being something he is quite happy to make. Considering the worst scenario, "It was," he notes, "within my power to bring the performance to a halt at any time upon some pretext or other and start the show again." There was a break in the recording before the second phase of the routine. Props were reset and David recruited his second volunteer. Once again the psychological force was used, David leafing through the catalogue and pointing out that as the dressing table had already been chosen the volunteer might like to pick something else. He was encouraged to pick something unusual and sure enough the rocking horse was the most interesting item in the pages that followed. This time there was no need for secrecy, the stage was already set, and David casually asked the volunteer which item he had chosen. It was the rocking horse and the volunteer obligingly chose it again later, this time on camera. Again this will appear a high-risk strategy but that is perhaps because it is almost impossible to convey on paper the kind of social and psychological persuasion that can be exercised during the course of a professional performance. And, of course, David has a knack of persuading people to do almost anything! 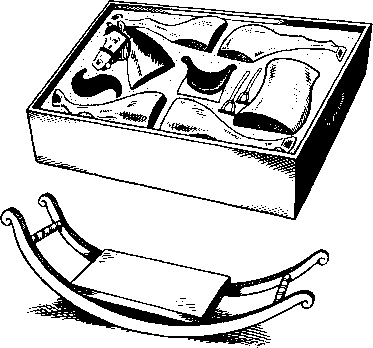 There was no such thing as a commercially sold self-assembly rocking horse. David had concocted that notion. But to make it believable he had inserted a photograph of another child's toy, a locomotive, into the first pages of the brochure. Since there were two large toy kits represented in the brochure the rocking horse did not seem out of place. He had intended to finish the routine with the production of an animal but lions, tigers or elephants were impractical on this occasion. And dogs and cats were too small and not unusual enough. He found the ideal creature in the shape of a miniature breed of horse called Falabella. It doesn't have the large belly of a pony. It is a perfectly proportioned but miniature horse. The kit was specially modelled to match and consisted of the head, middle and rear section, a tail, separate legs, and a saddle complete with stirrups, reins and the rocking base. The cabinet was genuinely empty prior to the appearance of the horse. The animal had been kept backstage all day in a horsebox that was designed to look like a large crate. David wanted as few people as possible to know about the horse so that the surprise in the studio would be greater when it finally appeared. 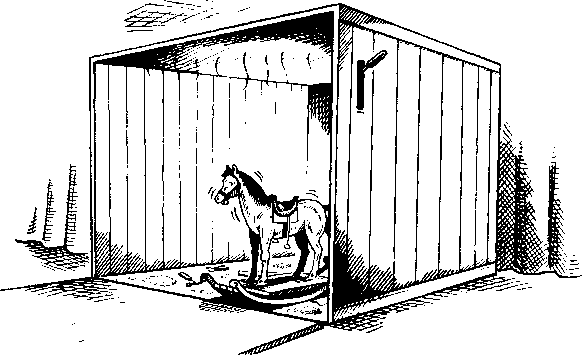 The horse was pushed through a slit in the backcloth and through a trapdoor in the rear of the box. The two volunteers standing guard at the rear corners of the box were confederates whose presence helped block the precarious angles as the horse was pushed through. No one heard the horse walk in because it didn't actually walk. It was already standing on the rocking base that was fixed with castors so it could be easily pushed across the studio floor. A secret assistant pulled the rocking horse kit out just before the real horse went in. A nylon line was attached to the rockers and could be pulled from behind the studio backcloth to set the base rocking just before the door to the box was opened. Three weeks were spent rehearsing with the horse. Each day it was trained to leave the rocking base and walk towards David where it would get its sugar reward. Keeping the horse stationary until that moment was, perhaps, David's biggest secret. He had discovered that a horse wouldn't struggle if you held its hooves still. And using that piece of information he installed a set of clamps into the rocking horse base. They locked the hooves and immobilised the horse until David snapped his fingers. The clamps caused no harm or injury and were released by another nylon line operated from backstage. The rocking motion of the horse would disguise any blinking of the eyes but David's main fear was that when the door was opened the horse would move its head and prematurely give away the climax. To minimise the risk of any unexpected movement being seen he positioned himself in front of the doorway. But the horse was well behaved and everything went smoothly. There was a lot of excitement in the studio. 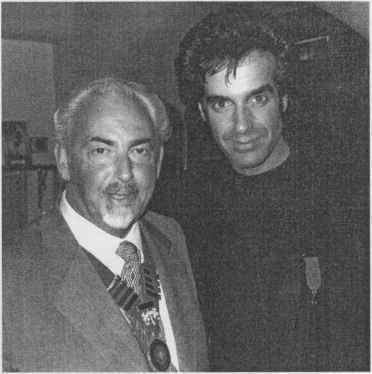 Elkan Allen ran up to David and said that before the pilot the series was 90% sure. Now it was 99%. Things couldn't have been better and British television looked like it was about to see the debut of a new and exciting magic project. The routine had gone better than even David had hoped for because not only was Elkan Allen pleased but so too were the many senior producers, including John MacMillan, Head of Programmes, who watched the show on the in-house close-circuit monitors. MacMillan thought that the show was far too good for the 7.30 pm slot it had been allocated. He insisted it be transmitted at a later time, peak time viewing in fact. Buoyed by this good news, and expecting to soon have his own twelve-part television series, David began to organise an autumn theatre tour to capitalise on his forthcoming show. He contacted Moss Empires who were looking for something solid to fill their theatres in autumn, between the Summer Season and Christmas Pantomimes. They agreed a 40/60 split on the takings with 40% going to David. However, they would take care of the advertising, theatre staff and stage crew and he need only provide the show. If he only half-filled the theatres, he would still do very well. To coincide with the tour he also arranged sponsorship from Coca Cola and the publishers of Encyclopaedia Britannica. But time was short and David needed to organise the routines and build the props that would see him through the television series. The show was still not commissioned, but hadn't Allen and MacMillan said the deal was as good as done? David decided to finance the development himself in the belief that his efforts would soon be repaid. He realised all the assets he could and ploughed it into the television show and the proposed theatre tour. And then he waited.